As a grassroots organization, we base our advocacy on positions adopted through a consensus process. Members decide to study an issue, form a committee to explore it and then reach consensus on a position. We adopt positions on the national, state, county and local levels. Topics of recent consensus meetings include immigration, support for the National Popular Vote Compact, Money in Politics. 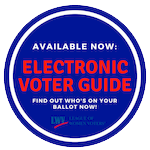 If the civic issues that affect our lives interest you, consider joining the League of Women Voters. Working with other members, you can educate yourself, help develop positions, and gain opportunities to advocate on those issues you think are important. If you are already a member, why not join the committee that works on the issue most of interest to you? And do try to attend our public meetings addressing quality of life issues in our East End communities. Democracy is not a spectator sport. Encourage conformity regarding Absentee Ballot applications in the towns and villages.